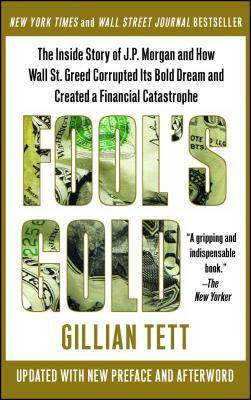 From award-winning Financial Times journalist Gillian Tett, who enraged Wall Street leaders with her news-breaking warnings of a crisis more than a year ahead of the curve, Fool’s Gold tells the astonishing unknown story at the heart of the 2008 meltdown. Drawing on exclusive access to J.P. Morgan CEO Jamie Dimon and a tightly bonded team of bankers known on Wall Street as the “Morgan Mafia,” as well as in-depth interviews with dozens of other key players, including Treasury Secretary Timothy Geithner, Tett brings to life in gripping detail how the Morgan team’s bold ideas for a whole new kind of financial alchemy helped to ignite a revolution in banking, and how that revolution escalated wildly out of control. The deeply reported and lively narrative takes readers behind the scenes, to the inner sanctums of elite finance and to the secretive reaches of what came to be known as the “shadow banking” world. The story begins with the intense Morgan brainstorming session in 1994 beside a pool in Boca Raton, where the team cooked up a dazzling new idea for the exotic financial product known as credit derivatives. That idea would rip around the banking world, catapult Morgan to the top of the turbocharged derivatives trade, and fuel an extraordinary banking boom that seemed to have unleashed banks from ages-old constraints of risk. But when the Morgan team’s derivatives dream collided with the housing boom, and was perverted—through hubris, delusion, and sheer greed—by titans of banking that included Citigroup, UBS, Deutsche Bank, and the thundering herd at Merrill Lynch—even as J.P. Morgan itself stayed well away from the risky concoctions others were peddling—catastrophe followed. Tett’s access to Dimon and the J.P. Morgan leaders who so skillfully steered their bank away from the wild excesses of others sheds invaluable light not only on the untold story of how they engineered their bank’s escape from carnage but also on how possible it was for the larger banking world, regulators, and rating agencies to have spotted, and heeded, the terrible risks of a meltdown. A tale of blistering brilliance and willfully blind ambition, Fool’s Gold is both a rare journey deep inside the arcane and wildly competitive world of high finance and a vital contribution to understanding how the worst economic crisis since the Great Depression was perpetrated. Gillian Tett oversees global coverage of the financial markets for the Financial Times, the world’s leading newspaper covering finance and business. In 2007 she was awarded the Wincott prize, the premier British award for financial journalism, and in 2008 was named British Business Journalist of the Year. Tett is the author of Saving the Sun: How Wall Street Mavericks Shook Up Japan’s Financial World and Made Billions and The Silo Effect: Ordered Chaos, the Peril of Expertise, and the Power of Breaking Down Barriers.